The Sanyo ECJ-HC100S is an exciting multi-purpose rice cooking device. While I usually recommend that you should choose a Zojirushi rice cooker, this machine has so many features for such a reasonable price that it is well worth investigating further. 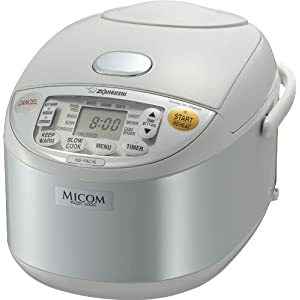 This machine is an advanced Micom rice cooker but it comes at a very reasonable price. Finding the best deal on this particular machine is the same for any high quality rice cooker. The lowest prices that I have discovered on the internet are through the Amazon online shopping store. On almost all rice cooker orders they offer free super saver shipping. So the price you see advertised is the price you pay. If you compare the price of the Sanyo ECJ-HC100S on the official Sanyo website with Amazon, you will be able to see which has the lowest price. This unit is a 10 cup rice cooker. This is typically the largest size that would be used for home use. A machine of this size can cook enough rice for more than fifteen people when it is filled to capacity. It is a great sized machine for larger families and those of you who enjoy catering for friends and family. It is a Fuzzy Logic rice cooker which is an advanced Micom computer chip that helps to prepare the best textured and tastiest rice. This machine is much more versatile than most rice cookers on the market today. As you would expect, it can make great tasting rice. But this is only the beginning. Other ways that you can use this device are as a slow cooker, it can be used to steam both seafood and vegetables and it also has a tofu making function. As you can see, it combines a number of cooking functions into one compact kitchen appliance. 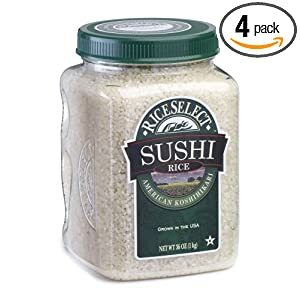 It can prepare a wide range of different types of rice including white, mixed, rinse-free, brown, haiga and sushi rice as well as giving you a choice as to how firm or soft you want your rice to be. The Sanyo ECJ-HC100S comes with lots of different equipment. There is a removable steam vent on the top of the unit. Then you also get a removable inner lid for rice cooking and a rice cooking inner bowl. When you use the slow cooking setting, you use a different inner cooking bowl and inner lid. There is a steamer tray and also a tofu container. On top of this you get a non-stick plastic spatula, a spatula holder, a measuring cup (180ml) and a recipe booklet. If you are lucky, you may be able to find all this for under $150. It really depends upon what you are looking for in a rice cooker as to which one is better for you. The Zojirushi NS-ZCC18 would be my recommendation if you want a top quality 10 cup rice cooker for round about $150. This machine is also a Fuzzy Logic device and has what Zojirushi call Neuro Fuzzy technology. The NS-ZCC18 would be my recommendation if you want the best rice. However it does not have the additional options of the ECJ-HC100S. So the Sanyo machine does have more varied uses. The bottom line is that both machines are decent rice cookers and you will not be disappointed with either. These two machines are roughly the same sort of price. You should be able to find them both for less than $150. The Sanyo is certainly the more versatile of the two with more overall cooking functions. The Zojirushi NS-TGC18 does offer you the option of being able to make cakes in your rice cooker. If brand is important to you, Zojirushi are regarded as the best rice cookers. However I think the Sanyo ECJ-HC100S offers really good value for money due to the huge number of cooking options it has.